Utilizing roll off dumpsters to tackle those hard to finish tasks and jobs. 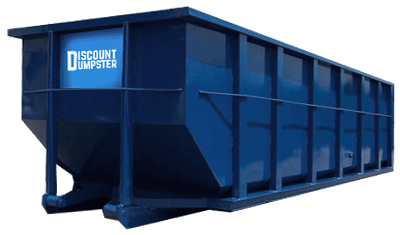 With fast, reliable, and friendly service Discount Dumpster makes the ordering process easy over the phone and online. Our flexible roll off sizes range from 10 cubic yards up to 40 cubic yards. Common projects for a roll off dumpster range from cleaning our junk from you home all the way up to full demolition jobs. To understand which size will work well with your job simply give us a call. The simple three step process (link to how it works) gets a roll off dumpster rental delivered to your home, job site, or property in no time. When getting ready for a large project renting a dumpster will be your best bet. All of our containers are open-top dumpsters that are delivered to the site of your choosing. Though they range in size every dumpster is equipped with a large gate in the rear of the container for easy waste disposal. After you have filled the container Discount Dumpster will haul it to the dump for you. The right size roll off(link to sizes) will need to match up with the size of the job. Common residential dumpsters (link) are 10 yard, 15 yard and 20 yard which are great for DIY projects and home remodels. Larger containers such as 30 yard and 40 yard roll off dumpsters are used on construction sites (link) and allow for maximum disposal. Commercial dumpsters are also available for large residential projects. Roll Off Dumpster Rentals are best used for large jobs which your local trash company is unable to haul everything away for you. Whether it be cleaning out your home, garage, or landscaping a large trash container will work well. All bid DIY home projects create extra trash and junk that can’t fit into your trash can, but no project is too big or small for our roll away dumpsters. Founded on the idea that hauling your junk away should be easy we created the simple process of hauling away your trash at a low affordable rate. Where some companies tack on extra charges for delivery, pickup, or dump fees, Discount Dumpster charges you one flat rate. The price you are quoted is the price you will pay. We told you it was simple. All roll off dumpsters are equipped with reinforced sides creating strong walls to haul large amount of debris and waste material. Rent one for your home or construction job to get rid of the mess and continue with an organized working environment. Once we receive the details of your job and location we will quickly work to deliver your dumpster as soon as possible. With a simple call we can get your order processed today.